But Wall Street isn't simply about institutions or corporate battles. It’s a landscape dominated by personalities. 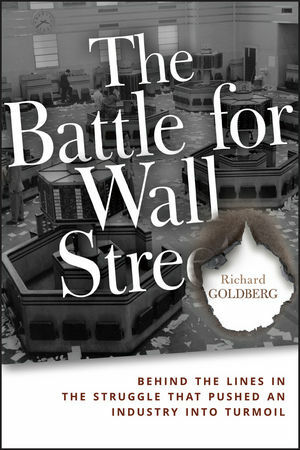 Goldberg's unique access to major players will bring this book to life with amazing anecdotes and stories about the financial generals who have left their mark in The Battle for Wall Street. Richard Goldberg (New York, NY) is currently a Managing Director of Putnam Lovell NBF Securities Inc., a leading investment bank to the global financial services community. He is also an Adjunct Associate Professor at Columbia University's School of International & Public Affairs and is a visiting Adjunct Professor at Brandeis University's International Business School. Goldberg has advised on significant deals including the Dean Witter/Morgan Stanley merger, the UBS acquisition of PaineWebber the Herzog Heine sale to Merrill Lynch, the DLJ sale to Credit Suisse, the D.E. Shaw sale of selected businesses to KBC Bank N.V. and SunAmerica merger with AIG. He received an MBA from the Wharton School of Business at the University of Pennsylvania.